This sculpture by Michael Lancaster was thrown, altered and assembled, then raku fired with ferric chloride fuming. I participated in a raku firing (Western style) when I was an undergrad in one of Matt Long’s classes at Ohio University. It is no wonder raku is such a popular technique among potters and ceramic artists because what’s not to love about playing so directly with fire? But, like many ceramic techniques, it is extremely important to follow strict safety guidelines, not only to protect yourself from the open flame, but also the fumes that can damage your lungs. In today’s feature, ceramic artist and long-time raku practitioner Michael Lancaster shares some of the things he has learned over his many years of firing raku. – Jennifer Harnetty, editor. Standing next to the raku kiln, Lancaster demonstrates full respiratory protection. The blue mits are for removing large works from the kiln. In his hands, he is holding Kevlar gloves, which are used for turning the hot pieces over in the reduction barrels. I look back to 1977, the first year I ever fired American raku. I think, secretly, “It’s a miracle any of us have survived this long!” We were fuming with petrochemicals, smoking with sawdust, newspaper, pine needles, straw and even unknown combustible garbage. Working with clay can, for a potter or a sculptor, be a romantically “macho” sort of thing, especially when it comes to dancing with fire. In this age of YouTube and online movies, the ceramist can view many different approaches to firing and safety. I have seen some that are downright scary. For example, wearing paper dust masks for lung protection, wearing nylon jackets, synthetic jogging outfits, shorts, sandals and rarely do I see a fire extinguisher in the background. From experience I have found that clothes can ignite, hair gets burned off, hands burn, and lungs and mucous membranes can be damaged – even permanently! I have come up with a few simple items that can help make raku more safe. First, to protect eyes, face, mucous membranes and lungs, I recommend Color Code Olive/Magenta P100 Defender respirator cartridges from North or another company using the same codes in a welder’s clear plastic face and respirator shield. The cartridges will arrest the fumes and smoke from welding and will help for most of the smoke from Raku. The plastic lenses generally are not fireproof, however will shield from some flame up and will keep the smoke and fumes from your eyes. At a minimum, care should be taken to be sure all clothes are cotton. We also wear split-hide welders jackets. Some of my colleagues wear full-hide aprons that go all the way to the shins. This can be helpful for extended moments reaching with mits into the kiln. We also wear different gloves for different tasks. I wear Kevlar gloves for general work and they last about three firings (that’s about five to six firings each time from a 30-cubic-foot kiln). I use a higher-temp Kevlar combination fiber mitt for hand lifting works that are too big for the tongs. Boots with more leather and less plastic are helpful as I have had boots burst into flame. When fuming, it is an absolute must to wear good lung protection. It is extremely important that anyone within a 30-foot circumference also be protected. Fuming ingredients such as ferric chloride, ammonium chloride, copper sulfate, etc., make caustic gases which can burn sinuses, throat, esophagus and lung tissue and can cause permanent damage. Finally, always keep a fire extinguisher on hand. It could save a life. Raku should be fun, passionate, and, with a calm approach, safe. To learn more about raku and other alternative firing methods, be sure to check out Raku, Pit and Barrel: Firing Techniques in the Ceramic Arts Daily Bookstore. For more great alternative firing techniques, be sure to download your free copy of Successful Tips and Techniques for Raku Firing: How to Select Raku Clays, Glazes, Kilns and Combustibles. american raku, clay, copper sulfate, foot, fuming, reduction, split. Bonjour, j’aimerai comprendre comment vous faites du Raku, en France, le four est fermé et lorsque l’émail brille vers les 980°, on ouvre le four et on retire les pièces que l’on met dans la sciure dans un bac en fer et on referme le couvercle 10 mns plus tard on ressort la pièce et on la jette dans l’eau. Cela n’est pas aussi dangereux que vous le décrivez. Comment faites vous votre raku en Amérique ? Hello, I’d like to understand how you are doing Raku, France, the oven is closed and once the enamel shines to 980 °, open the oven and parts that we put in the sawdust is removed in a tank iron and the lid 10 is closed mins later the piece is spring and it is thrown into the water. This is not as dangerous as you describe. How you make your raku in America? Thanks so much for this article. I have been using a half mask for years thinking it was the best I could do. The local safety supply place didn’t ever tell me that they weren’t legally allowed to suggest appropriate protection (liability), and I foolishly trusted that since I had told them what i was using the half mask for, I was ok…. This new system is going to not only help with raku . but for spraying ferric chloride. So far, my protection has been to stay upwind in the half mask and move fast! For doing Raku both of us use firefighter turn out or bunker gear. It is designed for protection against fire. Many local fire departments upgrade their gear periodically, you might approach them about obtaining older gear, which should still give good protection. I have been practicing Raku for several years and have had my work published in three recent books. Since I have my own studio, I am in complete control of my practice, a luxury not afforded to those who fire in a group setting. Here’s what I do to ensure a safe firing: First I sweep the area around my kiln and reduction cans (ie, trash cans)clean of any flammable debris. I wear a cowhide apron, which is relatively inexpensive on welders’ sites, long sleeves of natural material, jeans, socks and close toed shoes. I wear a cap to protect my hair. As a woman, I find Raku gloves unwieldy, which would make them less safe, so I wear suede garden gloves and replace them after a few uses. Michael is totally correct that some of the videos on the web are scary. They often focus on dramatic fires, but I minimize flames by putting ONLY ONE PIECE per can. I let the flames build up so that I can get a good reduction and then quickly cover the can, using my tongs so that my face and body are not close to the flames. Because I don’t use oxides to color my glazes and I don’t fume, I don’t use a respirator or mask of any kind. Then I let the can cool until I can safely remove the piece without fear of a flare-up. I use small propane tanks for fuel, and to prevent them from freezing up, I use a hose to run water down the side of the tank. Should there be a fire, I can quickly grab the hose (there’s no grease, so the danger would be if the wind caught a leaf and then carried the burning leaf outside my cleared area. And since I also avoid firing on windy days, this risk is minimal. When firing in a group, I recommend following as many of these same procedures as possible. Add the mask recommended in the article — there’ll be more smoke. 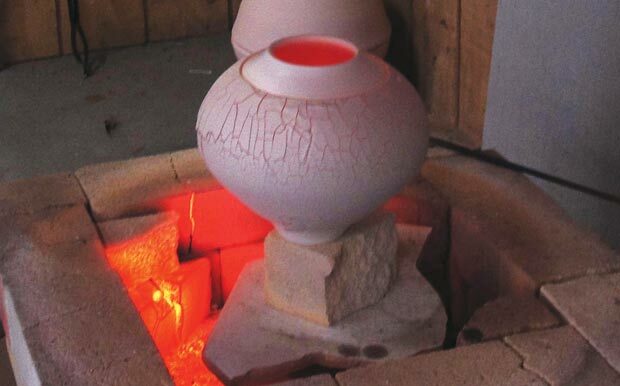 Participants need to organize themselves prior to closing the kiln and put their reduction chamber(s) near the side where they placed their pots. If a can has to be opened after putting in one piece, have something handy to extinguish flames (in case) and try to open the can with tongs. If working with a “buddy,” don’t open the can until the piece is right there. Work quickly and close the can again as soon as there are flames (which will be almost immediately). 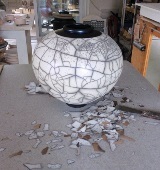 The “wow”factor in Raku comes from safely removing an intact piece from the kiln and washing it to reveal its colors.